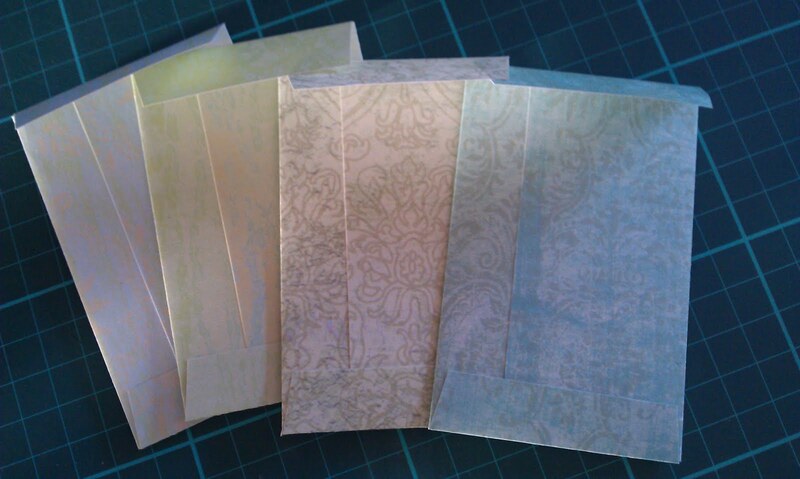 I’m still on the envelope making binge and have been putting together these little gift envelopes. 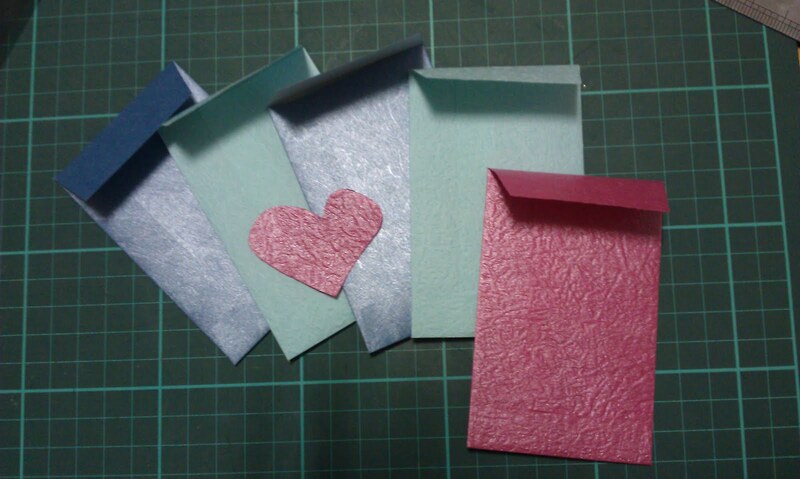 I’ve been experimenting with different papers and different envelope templates. It turns out that the template shape is not just important for look and feel of the finished envelope, it’s also very important for maximising the use of your paper. I’ve nicknamed the two main templates I’ve been using as “Mini-long” and “Mini-wide”. Both templates were made by opening an existing envelope and altering it to suit. Just a few tweaks to make the design more friendly and easier to work with – smaller sizes, no rounded corners, larger top flap, that kind of thing. Mini-long has two thin side tabs and a large back flap that is folded up. It’s great for using the strip of paper left over from making a standard sized envelope from a piece of scrapbook paper. 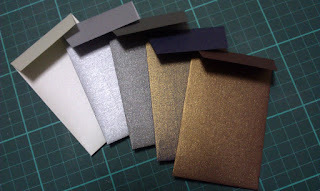 It’s also great for getting two mini envelopes from one A4 sheet of paper. Mini-wide on the other hand has two large side flaps that fold in to meet and create the back, and a thin bottom flap that folds up to complete the envelope. It’s great when using the smaller squared pieces of scrapbook paper. All of the little envelopes pictured were made with the mini-wide template, you can see the crease down the backs where the flaps meet. 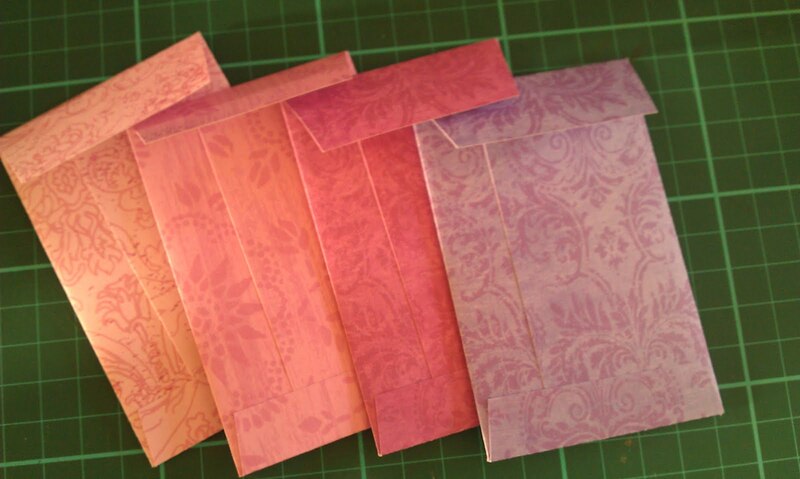 The finished envelopes measure approx 6cm x 9.5cm. Do you have a preferred envelope template you use? Did you purchase your template or is it one you made/altered yourself? This entry was posted in Snail Mail and tagged Envelopes by Sammie. Bookmark the permalink. Your envelopes are so perfect! When I make envelopes it is usually custom for whatever I am sending so the envelope not being decorated looks a little sloppy in my option. I bought a template of Etsy but found the envelopes where to small. I am going to have to re-try it though since it has been awhile since I have used it. I am happy to see your mail goals. I just wanted to let you know that I have added your blog to the list on my Mail Love Resource page on my blog. I hope you have a wonderfully creative long weekend. P.S. You can expect something in the mail from me soon!